With the autumn season comes the gorgeous display of fall foliage. After the summer heat subsides, trees transform from a luscious green into a fiery display of red, orange, and yellow hues. The color-changing process is simply magical. But as with most phenomena in the world, there is a thorough scientific explanation of this magic, and consequently as to why leaves change color in the fall. While the leaves in their autumn hues are beautiful, the reason behind their transformation is anything but. We are, in essence, watching the leaves starve themselves and die. But first, to understand why leaves change colors come fall, it’s important to understand why they’re green in the first place. At one point or another, you’ve probably learned about the process of photosynthesis. If not, here’s a short explanation. Photosynthesis, in plain English, means “putting together with light,” and that’s because plants literally put two ingredients together with sunlight in order to make the food it needs to survive. Plants need three things to keep them alive — water, carbon dioxide, and sunlight. Water is absorbed by a tree or plant through its roots. Carbon dioxide is absorbed via tiny holes in plant’s leaves, flowers, branches, stems, as well as its roots. Sunlight is absorbed by a chemical in the tree’s leaves known as chlorophyll. Chlorophyll absorbs red and blue light, which is why it looks green. Once the sunlight has been absorbed, it reacts with the water and carbon dioxide that was also absorbed in order to produce sugars, which is essentially plant food. Those sugars are then transported throughout the plant as fuel. Because chlorophyll needs sunlight and warmth in order for a plant to produce it, chlorophyll production begins to deteriorate when the colder months set in — and this is why leaves change color come fall. In addition to the green pigments of chlorophyll, a plant’s leaves also have yellow and orange pigments in them all the time. Yellow and orange colors are due to pigments called carotenoids, which are also responsible for the color in carrots and in corn. But most of the year these other, warmer, colors are masked by the great amounts of chlorophyll in the plant. When temperatures begin to drop and chlorophyll production begins to decline, those other colors are revealed. 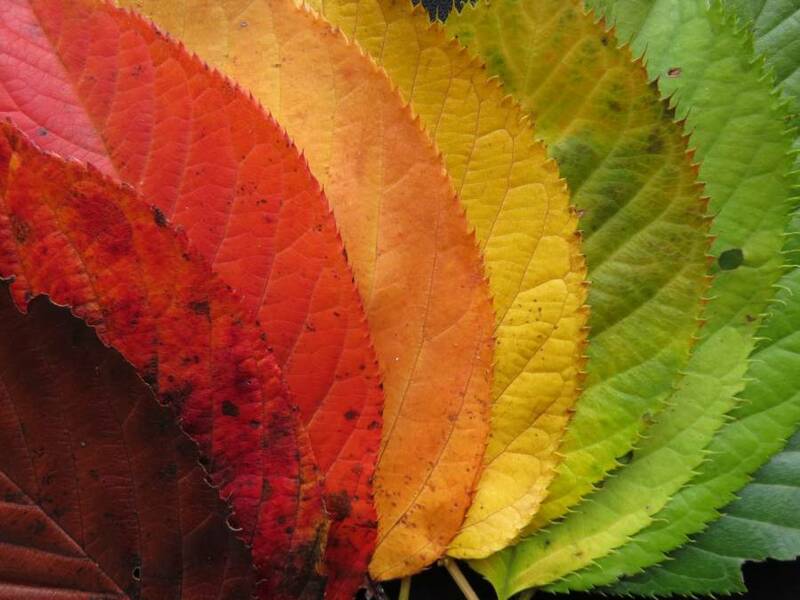 “The color of a leaf is subtractive, like crayons on a piece of paper,” David Lee, who has studied leaf color since 1973, explains of why leaves change color. When leaves change color, another pigment becomes visible: flavonoids, which are responsible for the reds. 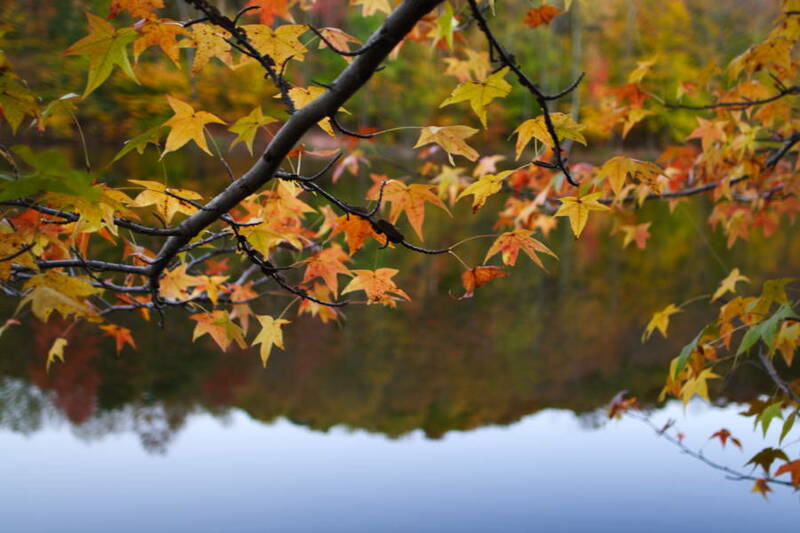 These colors are particular to fall because their pigment is created only when the temperature drops. Fall is often some combination of bright sunlight but cooler air, and it’s under these conditions that amber, red, and magenta hues in leaves can be produced. Consequently, autumns with a lot of sunny days and cold nights will actually have the brightest red colors. The intensity of the leaves will vary based on moisture and temperature, and sudden frost can stunt more brilliant colors from being revealed. 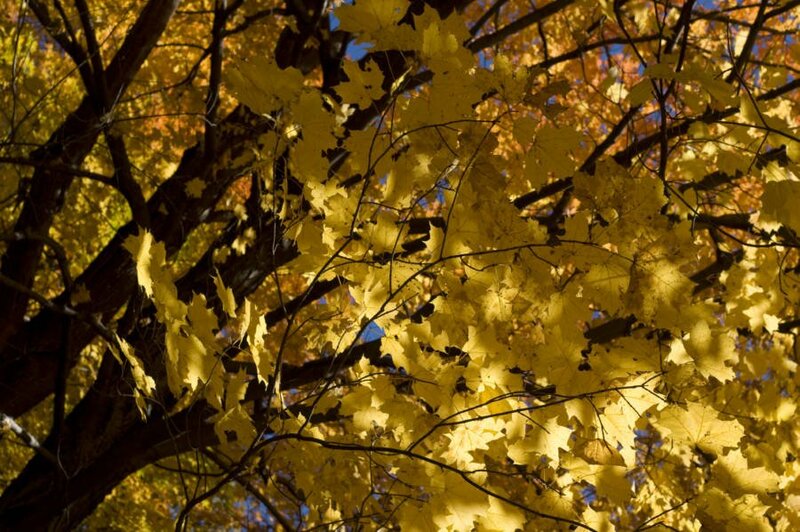 When leaves start to prepare to fall off the trees come winter, a layer of cells form along the base of its stalk. This formation effectively seals off the movement of sugar from leaf to tree, and when that leaf is blown off, it leaves behind a leaf scar. The remaining sugars are stored in the tree. The sugars that are left in the leaf react with cell sap to produce anthocyanin, which is a flavonoid compound that presents itself in red, blue, purple, or magenta pigment. The hues of anthocyanin also depend on the plant’s soil acidity. 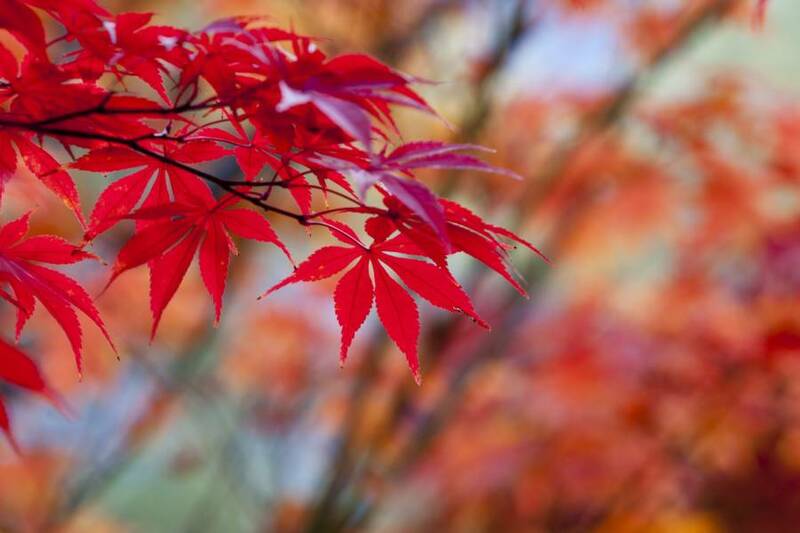 This means that trees in different parts of the world will display different hues of red or magenta. Indeed, some species of trees even are subject to more brilliant reds than others, like maples, sweet gum, and dogwood. Anthocyanins will also combine and blend with the other yellow and orange pigments in the leaf. Some tree leaves, then, will be multicolored and display different shades of yellow, orange, and red all in a single leaf. These pigments too, though, will eventually degrade, and a dull brown will remain. All told, as the leaf shuts down food production for the tree, its many pigments degrade from green to yellow, orange, red, and sometimes purple, until it is brown and dead. “Because plants evolve very slowly, we still see the colors. So leaf color is a fossil memory, something that existed for a reason millions of years ago but that serves no purpose now,” suggests Bryan A. Hanson, professor of chemistry and biochemistry at DePauw University. But as with all beautiful phenomena that we witness on this earth, science can only explain so much, and the rest is just pure magic.